FARWELL, Mich. (August 9, 2018) – As Marine Corporal Joe Pawlowski was undergoing a long recuperative period from injuries received in Iraq, he decided his love of painting would be a great therapy to help strengthen his injured arm and serve as emotional and mental healing. It worked so well for the Purple Heart recipient, he figured his talent with a brush may well help other recovering veterans. For the past several years Pawlowski has been commissioning one-of-a-kind custom art pieces while working from a studio in his garage. Whether it be by traditional brush or by air brush, he has painted everything from combat scenes to memorials to American flags and more on every possible surface imaginable. His work decorates motorcycle fenders, gas tanks and saddle bags, guitars, mailboxes, snowmobiles, helmets, hard hats and even hockey masks. Now, thanks to Hope For The Warriors® and its A Warrior’s Wish® program, the father of three can expand his growing passion with the construction of an art studio. 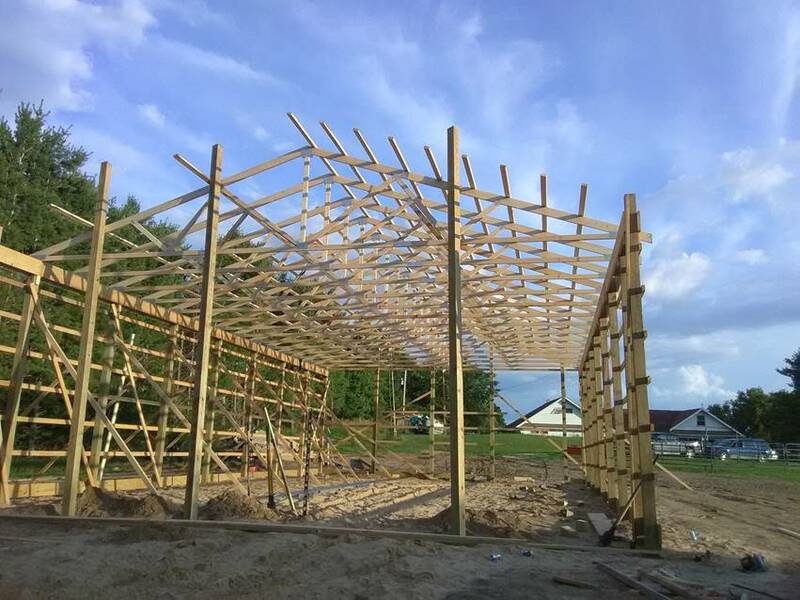 Hope For The Warriors is covering the nearly $30,000 cost of supplies for the building, while Pawlowski and his friends are constructing it. He hopes to have it under roof by winter and helping to serve his fellow veterans not long after. Hope For The Warriors is a national nonprofit dedicated to restoring a sense of self, family and hope to service members, their families, and families of the fallen. Its first established program, A Warrior’s Wish, honors the goals and desires of severely wounded service members, veterans, and their families. “With the completion of the new studio, there will be plenty of room for projects,” said Pawlowski “I am very thankful and blessed that Hope For The Warriors decided to grant this wish of mine. They are not only helping to continue my recovery but also my dream of helping other veterans recover as well thru my art. “I can’t explain how much this means to me and my family,” he added. Pawlowski enlisted in the United States Marine Corps Reserves in 2003 and served with the Infantry Unit, 1st Battalion 24th Marine Division. He deployed in 2006 to Fallujah and patrolled the city in search of enemy activity and weapon caches and to support the locals however possible. On December 28, 2006, his squad was on patrol in a well-known insurgent area when they were ambushed. Three fellow Marines were killed in action and he was wounded in his left arm by a sniper. Pawlowski was medically evacuated to Balboa Naval Hospital and had several surgeries attempting to salvage his dominant left arm. Part of his yearlong physical therapy included drawing which promoted regaining strength and motor skills in his left hand. After more than four years of service, he medically retired from the United States Marine Corps in 2007 with a Purple Heart Medal. In 2018, 20 wishes will be granted through Hope For The Warriors. The wishes fulfill a desire for a better quality of life or support a quest for gratifying endeavors for those who have sustained severe physical and psychological wounds in the line of duty. Since the program’s inception, A Warrior’s Wish has granted 186 wishes. For sponsorship and volunteer opportunities for the A Warrior’s Wish program, contact Chrystal Keilers at ckeilers@hopeforthewarriors.org or (832) 776-9379. To apply for a wish, visit https://www.hopeforthewarriors.org/transition/a-warriors-wish/ and register online. For more information on Hope For The Warriors and A Warrior’s Wish, visit hopeforthewarriors.org, Facebook or Twitter. Founded in 2006, Hope For The Warriors is a national nonprofit dedicated to restoring a sense of self, family and hope for post 9/11 veterans, service members and military families. Since its inception, Hope For The Warriors has served more than 19,000 through a variety of support programs focused on clinical health and wellness, sports and recreation and transition. The nonprofit’s first program, A Warrior’s Wish, has granted more than 180 wishes to fulfill a desire for a better quality of life or support a quest for gratifying endeavors. In addition, Run For The Warriors has captured the hearts of more than 23,500 since 2010. For more information, visit hopeforthewarriors.org, Facebook or Twitter.